The native British Isles wolf species died out long ago. Wolves were once thriving in Britain and Ireland through ancient times, the Roman occcupation, Middle Ages and until the Rennaisance. Some wolves were still reported in the 19th Century in Scotland. According to fossil records, the native British and Irish wolves were as big as arctic wolves (the largest wolf species alive today). Humans since the Tudors and King James 1 drove wolves to extinction in a few centuries, wiping them out. Some bounties for wolf hunts were still open since the INdustrial Revolution. But have they all really died out? It is reported (only among paranormal research, cryptid sightings and alternative papers) that wolves may still exist in hiding. There are well know strange wolf and "werewolf" sightings in the 20th Century and now. Some people living near woods and hills have had unsettling wolf encounters, or photographed wolflike creatures. Others have listened to eerie howling coming from the open countryside where no one lives. Livestock have been found dead, and it's often considered that loose pet dogs were responsible, or even foxes (even though there were signs that a larger predator had been responsible). It's possible that there were mysterious big cats killing livestock and horses. They, too, are a phenomena of large wild cats roaming the landscape, seen by many, and then vanish into thin air. Is it likely that the native wolf of Britain and Ireland only exists in small isolated packs? What about the idea that the ancient wolf might have bred with dogs, producing a wolfdog mixture that entered the genepool of domestic dogs? 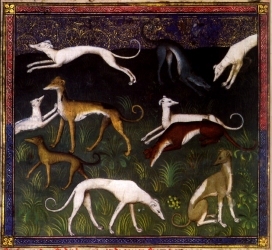 Some of the oldest dog breeds in the United Kingdom and Eire are the whippet, talbot (now extinct), otterhound, Old English sheepdog, English white terrier (now extinct), King Charles Spaniel, Norfolk spaniel (now extinct), Old English bulldog (now extinct), English water spaniel, English springer spaniel, English mastiff, curly coated retriever, bulldog, border collie, bloodhound, beagle, Irish wolfhound and greyhound. I wonder if some of the dogs we have today are descendants of those extinct wolves that roamed Britain and Ireland? Introducing "Tales of Bright Shadow"